There might be a few hundred reality shows based on cooking competitions. Some involve chefs, while others involve children trying to cook five star meals. It’s all terrible. 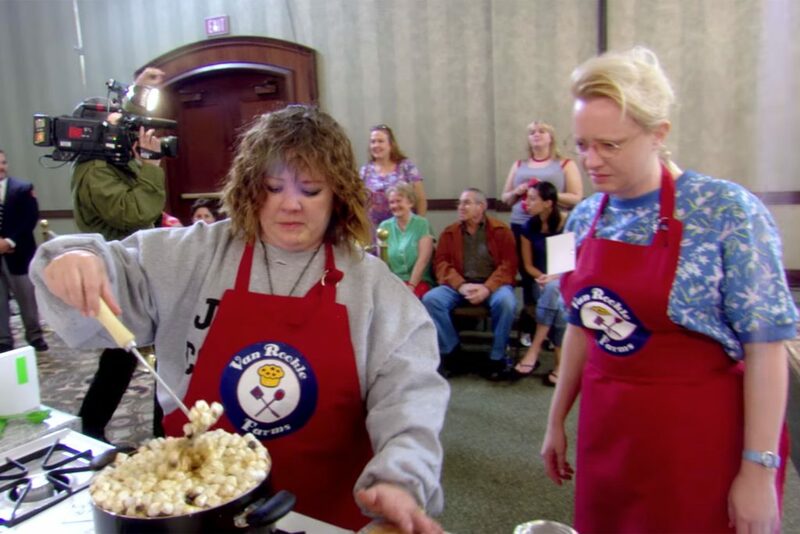 More than 10 years ago, a woman named Cathryn Michon made a film in the style of a Christopher Guest Mockumentary (Best in Show), called ‘Cook Off!‘, which showed us some whacky characters in a cooking competition. Again, this film was made more than 10 years ago and has been sitting on a shelf for the right time. Turns out, it was never the right time and for some reason, we have this horrible movie in front of us. The poster and cover art of ‘Cook Off!‘ would have you believe that Melissa McCarthy stars in the film as she is front and center on every piece of promotional material. That’s not the case though as she might have around 10 minutes of actual screen time in the whole film. This annoys me to great end when companies do this. One of the problems I think we have here with ‘Cook Off!‘ is that Cathryn Michon took on the roles of directing, producing, editing, writing, and starring in the film. She hasn’t done much at all and I don’t think she handled any of these aspects well at all. It’s a shell of a film that takes all of its cues from Christopher Guest, but never pulls off any of the dry humor, wit, or charm that any of his films have. Michon took on too much and it became a lazy script. She even had Wendi McLendon-Covey (Reno-911) help write the script here and there and star in the movie too, but nothing helped. Like ‘Best in Show‘, this ‘Cook Off!‘ film follows a group of off-beat individuals who enter a cooking contest to win a cash prize. We meet each of these individuals and their families first and see just how strange they are. The cooking competition gets underway and instead of having these entrants cook something delicious, they all cook their “best or favorite” meals, which are all flat out disgusting. One dish is even called “That Time of the Month Crab Puffs”. This is what we’re dealing with here. The humor isn’t subtle or witty. It’s just annoying and unfunny. I could go into each contestant here, but I won’t, because they are all the worst stereotypical characters you could write with no real direction. Even though the film is 98 minutes long, you still feel like 45 minutes needs to be cut out. It’s that bad, which is unfortunate, because there are so many great comedic actors here, but given the script, nobody could do anything to make it better. Stay clear of this one for sure, as you won’t have an appetite for anything after watching this. The Video: ‘Cook Off!‘ comes with a 1080p HD transfer and is presented in 1.85:1 aspect ratio. The film is shot to look like a guerrilla style documentary, so there are varying degrees of sharpness and color palettes. On the whole, the colors are warm and show good primaries, mainly being the color red in the competition room. Other shades of blues and yellows show up nicely throughout. Detail is sharp for the most part, but can be a bit murky and soft. I don’t believe this to be a transfer issue, but part of the overall style of the film. Since this is a documentary or shall I saw mockumentary, there are different cameras that have that “off the cusp” filmmaking that can add grain or fuzz to the image. It works well with the style for sure. Black levels are deep and inky and skin tones are natural if not a little on the warm side during a few scenes. There were no major issues with banding, aliasing, or video noise to speak of. The Audio: This release comes with a lossless DTS-HD MA 5.1 mix and sounds surprisingly good for a comedic mockumentary. Sound effects are robust and loud with tons of effects pouring through the surrounds. It’s not a big action movie by any means, but sounds of pans clanking, spoons hitting the cookware, people yelling and talking in the background at the competition all come at full force and immerses you into this chaotic cooking show. The songs in the film at the club pack some good bass, but other than those few scenes, the bass is dormant. Dialogue is clear and easy to follow along with, and free of any pops, cracks, and hiss. Cook Off! : The Ultimate Food Fight (HD, 15 Mins.) – Several of the actors in the film talk about making the movie. These interviews were made present day too, so it’s more of a reflection. They all seemed to love working with one another. Deleted Scenes (HD, 14 Mins.) – A few deleted scenes are shown here, none of which are any good. Outtakes (HD, 3 Mins.) – More like an extended scene that can be watched during the credits of the film. ‘Cook Off!‘ could have been a great film it was done by someone talented enough to make a funny and fully thought out film. Christopher Guest comes to mind. Unfortunately, that’s not the case here. It’s all rather lazy, unfunny, and annoying. If you’re hoping for a fun Melissa McCarthy role, don’t get excited. She’s barely in the film and might be her worst role yet. Even worse than ‘Ghostbusters’ and ‘Tammy’. The video and audio presentations are both good, but the extras aren’t worth your time. Skip This One For Sure! This entry was posted on Tuesday, January 30th, 2018 at 3:19 pm	and is filed under Film, News, Podcast. You can follow any responses to this entry through the RSS 2.0 feed. You can skip to the end and leave a response. Pinging is currently not allowed.